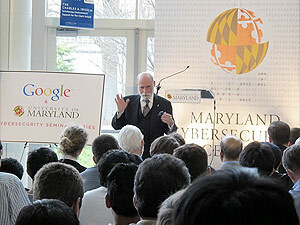 The Google and University of Maryland Cybersecurity Seminar Series opened with a special talk by Dr. Vint Cerf, Chief Internet Evangelist at Google, on Thursday, April 7 in the Jeong H. Kim Engineering Building Rotunda. Seating was filled to capacity, with over 200 guests from industry, government, and the university attending Cerf's talk, titled "Can We Make the Internet Safer?". In his talk, Cerf said that it is not too late to improve security capabilities of the Internet. He explained that the early Internet was set up as a collaborative system with no central control, and little thought to comprehensive security. Cerf argued that we must create incentives to lead participants to improve security, and that ultimately, we will need international agreements to help establish guidelines for security. The new seminar series, made possible by a sponsorship from Google, features a diverse group of speakers from industry, academia, and government, addressing a broad range of topics related to cybersecurity, including technology, policy, and economics. Invited speakers will also examine the impact that cybersecurity threats and protective measures are having on privacy, identity, social networks, business and national security. The new series is organized by the Maryland Cybersecurity Center (MC-squared), a multidisciplinary initiative at the University of Maryland aimed at research, education, and technology development in cybersecurity. MC-squared brings together faculty experts from engineering and computer science with colleagues from across campus in fields such as information sciences, business, public policy, social sciences and economics, mirroring the comprehensive perspective of the new seminar series that places special emphasis on “the human factor” of cybersecurity. The second Google and University of Maryland Cybersecurity Seminar will be held on Thursday, April 21, at 5:15 p.m., and will feature Martin Roesch, Chief Technology Officer (CTO) of Sourcefire®, a leader in intelligent cybersecurity solutions. The title of his talk will be "Intrusion Detection and Network Security Perspectives From A Veteran." The third and final spring seminar will be held on Thursday, June 16, at 4:30 pm in Ulrich Recital Hall in Tawes Hall, featuring Ari Schwartz, Senior Internet Policy Advisor at the National Institute of Standards and Technology (NIST). The title of his talk will be "The Future of Online Identity."